Approximately 11 million tons of asphalt roofing shingle scrap is generated each year in the United States. (3) There are two types of roofing shingle scraps. They are referred to as tear-off roofing shingles, and roofing shingle tabs, also called prompt roofing shingle scrap. Tear-off roofing shingles are generated during the demolition or replacement of existing roofs. Roofing shingle tabs are generated when new asphalt shingles are trimmed during production to the required physical dimensions or from "out-of-spec" shingles. Roofing shingle tab materials that result from shingle manufacture are estimated to range between 5 to 10% of the total production. Manufacturing shingle scraps production is about 1 million tons per year while tear-off shingle waste production is about 10-11 million tons per year so the manufacturing shingle scrap production is the smaller one. Asphalt shingle scrap created during the manufacturing process is generally uniform and homogenous. The content can be certified and free of debris. (3) The quality of tear-off roofing shingles can vary. Tear-off roofing shingles may contain debris such as nails, wood, paper, and plastic that is removed through processing. The aggregate in scrap shingles can be lost in the weathering process that occurs during the service period. As a result, tear-off scrap may contain more than 30% asphalt by weight. The aged binder in tear-off roofing scrap may also be hard or even brittle,(11) but tear-off shingle is easier to shred than factory scrap. Roofing shingles are produced by impregnating either organic felt produced from cellulose fibers, or glass felt produced from glass fibers, with a hot saturant asphalt, which is subsequently coated on both sides with more asphalt and finally surfaced with mineral granules. Most roofing shingles produced are of the organic felt type. The saturant and coating asphalt need not be the same. Both saturant and coating asphalts are produced by "blowing", a process in which air is bubbled through molten asphalt flux. The heat and oxygen act to change the characteristics of the asphalt. The process is monitored, and the "blowing" is stopped when the desired characteristics have been produced. The largest component of roofing shingles (60 to 70 percent by mass) is the mineral material. There are several different types in each shingle. 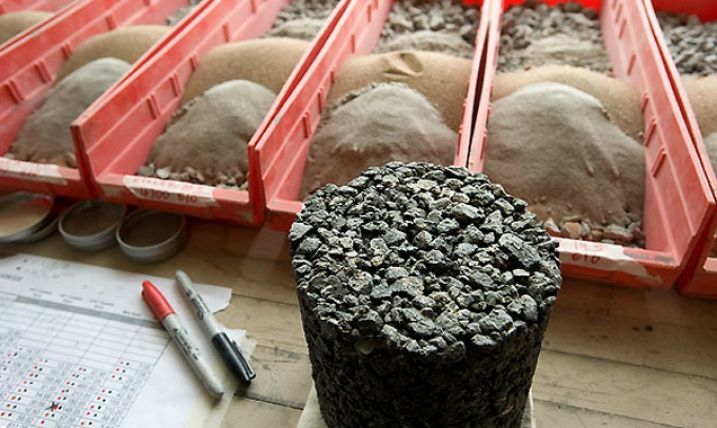 (7) They can include ceramic granules (comprising crushed rock particles, typically trap rock, coated with colored, ceramic oxides), lap granules (coal slag ground to roughly the same size as the ceramic granules), backsurfacer sand (washed, natural sand used in small quantities to keep packaged shingles from sticking together), and asphalt stabilizer (powdered limestone that is mixed into the asphalt). 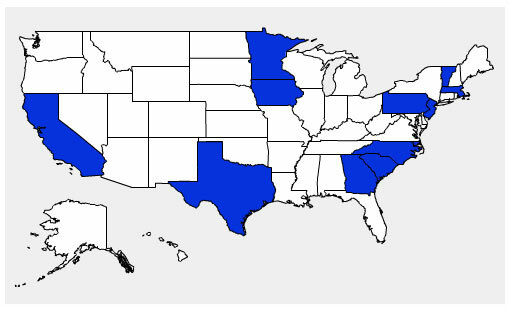 Below is a map showing states with shingle recycling projects and information. Georgia In 1997, the Georgia General Assembly passed legislation encouraging the recycling of asphalt shingles. 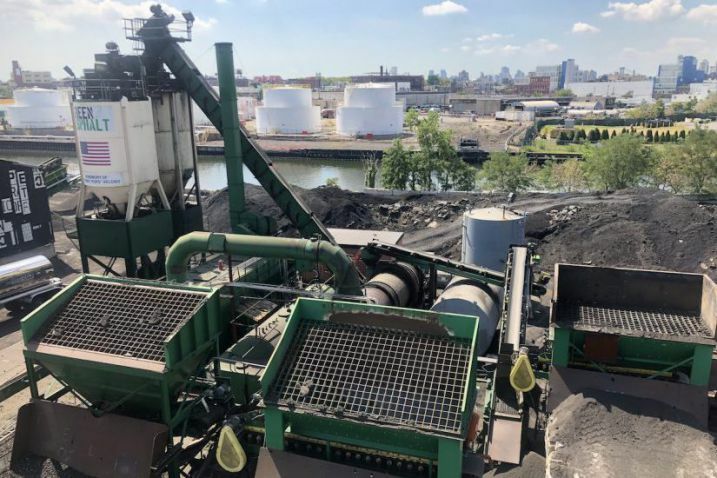 The legislation also required the Pollution Prevention Assistance Division to work with the Environmental Protection Division to develop a plan to encourage asphalt shingle scrap recycling A report has been prepared in response to this legislative requirement. Asphalt Roofing Shingle Report prepared for the Georgia General Assembly Watson, Donald E., et al., "Georgia's Experience with Recycled Roofing Shingles in Asphaltic Concrete. "Georgia Department of Transportation (GDOT), Forest Park, Georgia, 1998. Iowa Iowa Department of Transportation, "Determination and Evaluation for Alternative Methods for Managing and Controlling Highway-Related Dust, Phase II Demonstration Project" with Iowa State University, 2003. Iowa DOT. Iowa Department of Transportation, "Recycled Asphalt Shingles for Slurry Leveling and Crack Filling " with City of Spencer, Iowa, 2002. Iowa DOT .Lohnes, R. A.; Coree, B. J., "Determination and Evaluation of Alternate Methods for Managing and Controlling Highway-Related Dust" , Iowa Department of Transportation, June 30, 2002. Marks, Vernon J., and Petermeier, Gerald, "Let Me Shingle Your Roadway." Research Project HR-2079, Iowa Department of Transportation, Ames, Iowa, 1997. Massachusetts Bauman , Amy, "Asphalt Shingle Recycling in Massachusetts," a study sponsored by The Home Depot Foundation, March 15, 2005. Pennsylvania Boyle , Michael, " Materials-Related Forensic Analysis and Specialized Testing: Laboratory Evaluation of Hot-Mix Asphalt (HMA) Mixtures Containing Recycled or Waste Product Materials Using Performance Testing" , Valley Forge Laboratories Inc., Advanced Asphalt Technologies, LLC, Federal Highway Administration, Pennsylvania Department of Transportation, 2005.Hughes , John J.; Sypolt, Matthew, "Post-Consumer Shingles in HMA" , Pennsylvania Department of Transportation, Federal Highway Administration, Final Report, 2005.Reed , A., " Reclaimed Manufacturer Asphalt Roofing Shingles in Asphalt Mixtures. " Research Project N0. 91-77. Pennsylvania Department of Transportation, 40 pp. 1999. South Carolina Amirkhanian , S N; Vaughan , K M, "Field Evaluation of Use of Waste Shingles in Asphalt Mixtures" , Clemson University , South Carolina Department of Transportation, Federal Highway Administration, 2001. Texas TxDOT Experience with Shingles in HMA - Brochure Button , Joe W., et al., " Roofing Shingles and Toner in Asphalt Pavements. " Research Report 1344-2F, Texas Transportation Institute, College Station , Texas , 1995. (A short summary of the report can be found on the TxDOT site). Roofing shingle tabs (prompt shingle scrap) can be obtained directly from shingle manufacturers. Tear-off shingle scrap can be obtained directly from roofing contractors or disposal sites that accept the scrap. Information on tab or prompt scrap sources can be obtained from the roofing shingle suppliers or manufacturers. The general composition of asphalt shingles can vary. The typical asphalt shingle components are listed in Table 1. The American Society for Testing and Materials (ASTM) has specifications for roofing shingles. The specifications, ASTM D 255-86 (Asphalt Shingles [Organic Felt] Surfaced with Mineral Granules) and ASTM D3462-87 (Asphalt Shingles Made from Glass Felt and Surfaced with Mineral Granules) permit the use of a wide range of products. Prompt roofing shingle scrap is mainly produced in tabs approximately 285 mm long by 9.5 mm wide by 3 mm thickness (11.5 in by 3/8 in by 1/8 in) which must then be processed to suitable size for introduction into the hot mix asphalt. The asphalt tabs are processed in two stages. The tabs are first shredded using a rotary shredder consisting of two slow-speed blades turning at approximately 50 revolutions per minute. This reduces the chips into smaller, but still quite coarse pieces. The smaller pieces are then reduced to a nominal size of about 9.5 mm (3/8 in) or finer using a high-speed hammermill operating at about 800 to 900 revolutions per minute. To keep the roofing shingle material from agglomerating during processing the material is kept cool by watering at the hammer mill and then stockpiled. The application of water is not very desirable since the processed material becomes quite wet and must be dried prior to introduction into hot mix asphalt. (8) As an alternative to water shreds are sometimes blended with 20% sand or screenings to keep the shingles cool and limit dust. The sand and screenings would otherwise have been added later in the production of HMA and cold mix asphalt patching material; however by adding them earlier in the process it limits the use of water. Recycled asphalt pavement has also been mixed with the shredded shingles in order to prevent stockpile clumping. Roofing shingles incorporated into asphalt paving mixes not only modify the binder, but also, depending on the size of the shredded material, function like aggregate or mineral filler. Organic felt and glass felt particles in particular tend to function like a mineral filler substitute. Roofing shingles are unlike other by-product or secondary materials in that they contain components of fine aggregate, mineral filler, and asphalt cement. There are also differences between the types of shingles (organic and glass felt) produced. As shown in Table 2, organic felt shingles can be expected to exhibit higher moisture content and lower specific gravity than glass felt shingles. Shredded organic felt shingle scrap also exhibits much higher absorption than shredded fiberglass shingle scrap. Typical physical properties of recovered asphalt cement and the gradation of mineral granules in shingle scrap are listed in Table 3. Asphalt cement in old roofing shingles undergoes oxidative age hardening and stearic hardening (a hardening process in which solid compounds separate from volatile oils in the asphalt cement). Consequently, the asphalt cement in old tear-off roofing shingles is somewhat harder than new asphalt. Although the stearic hardening process has been demonstrated to be reversible by reheating and/or solubilizing,(6) oxidative age hardening is not reversible. Asbestos content in tear-off roofing shingles continue to be a concern for regulators. (13) A rigorous literature review and compilation of asbestos testing data was compiled in 2007 and found that asbestos was detected in just over 1% of the samples (out of 27,000). (14) Asphalt shingles contain asphalt a petroleum derived product that contains polycyclic aromatic hydrocarbons (PAHs). Questions have been raised as to whether ground up shingles pose a direct or leaching exposure risk, as well as potentially impacting hot mix asphalt plant emissions. (13) There is no literature to indicate emissions at hot mix plants are any different using shingles. Further research on the leachability is currently being conducted in Florida. ASTM D255, "Asphalt Shingles (Organic Felt) Surfaced into Mineral Granules." American Society for Testing and Materials, Annual Book of ASTM Standards , Volume 04.04, West Conshohocken , PA , 1996. ASTM D3462, "Asphalt Shingles Made From Glass Felt and Surfaced with Mineral Granules." American Society for Testing and Materials,Annual Book of ASTM Standards, Volume 04.04, West Conshohocken , PA , 1996 . EPA Region 5: Office of Solid Waste and Emergency Response (OSWER) Factsheet: "OSWER Innovations Pilot: Rear-Off Asphalt Shingles Recycling", May 2005. Foo, K.Y., Hanson, D. I., and Lynn, T. A., " Evaluation of Roofing Shingles in Hot Mix Asphalt ," Journal of Materials in Civil Engineering, Vol. 11, No. 1, February 1999, pp 15-20. Grodinsky, C., Plunkett, N., Surwilo, J., "Perforrmance of Recycled Asphalt Shingles for Road Applications ", Final Report, Vermont Agency of Natural Resources, Chittenden Solid Waste District, September 2002. Grzybowski, K. F. "Recycled Asphalt Roofing Materials - A Multi-Functional, Low Cost Hot-Mix Asphalt Pavement Additive." Use of Waste Materials in Hot-Mix Asphalt, American Society for Testing and Materials Special Technical Publication 1193, American Society for Testing and Materials, Phil adelphia , PA , 1993. Newcomb, D., Stroup-Gardiner, M., Weikle, B. and Dresher, A. Influence of Roofing on Asphalt Concrete Mixture Properties . Report prepared for Minnesota Department of Transportation at the University of Minnesota , March, 1993. Stroup-Gardiner, M., Newcomb, D. E., and Weikle, B. "Permanent Deformation and Low Temperature Behavior of Roofing Waste Modified HMA", Recovery and Effective Reuse of Discarded Materials and By-Products for Construction of Highway Facilities, Proceedings of FHWA Symposium, Denver, Colorado, October, 1993. National Asphalt Pavement Association ( NAPA ) "Special Report 179, Uses of Waste Asphalt Shingles in HMA . January 1997. Vermont Agency of Natural Resources, " Recycled Shingles in Road Applications , " September 1999. Watson, Donald E., et al., " Georgia's Experience with Recycled Roofing Shingles in Asphaltic Concrete. " TRR 1638, Transportation Research Board. National Research Council, Washington DC 1998. Dan Krivit and Associates, " Best Practices Guide", prepared for Construction Materials Recycling Association, October 11, 2007. Townsend, Tim; Powell, Jon; Xu, Chad "Environmental Issues", prepared for Construction Materials Recycling Association Asphalt Shingle Recycling Project, US EPA Innovations Workgroup, Innovative Waste Consulting Services, LLC, October 19, 2007. No special quality control techniques are required for prompt roofing shingle scrap; however, tear-off shingle scrap needs to be processed due to the presence of debris such as nails, wood, insulation, etc. Any debris must be removed to prevent equipment damage during size reduction and for beneficial use. The debris that contaminates tear-off roofing shingle scrap can be effectively removed. Nails are removed with magnets, paper and other lightweight contaminants are removed with blowers or vacuums. Asbestos testing can also be required for tear-off shingle by regulators. Roofing shingle scrap used in asphalt paving mixes is typically shredded into pieces approximately 13 mm (1/2 in) in size and smaller using a shingle shredding machine that consists of a rotary shredder and/or a high-speed hammermill. Some of the properties of roofing shingle tabs that are of particular interest when roofing shingles are used in asphalt paving include asphalt content, asphalt hardness (penetration/viscosity), and aggregate gradation. Asphalt Cement (AC) Content: The asphalt cement contained in prompt roofing shingle scrap is typically between 25 to 35 percent by weight. Accurate determination of the prompt shingle scrap asphalt content and penetration is not possible using conventional Abson recovery techniques. (23) The release of shingle asphalt binder into the virgin binder can result in reduced virgin asphalt binder requirements. The point of introduction must minimize damage to the recycled asphalt shingles from excess heat and maximize softening of shingle asphalt binder to facilitate the blending of the shingle asphalt binder with virgin asphalt binder. (2) Extended soaking periods are required to extract and determine the available asphalt. Asphalt Hardness (Viscosity/ Penetration): The precise determination of the AC viscosity and penetration is not possible because the roofing shingle asphalt is much harder than that normally used in asphalt concrete paving mixtures and contains fibers (which tend to stiffen asphalt concrete mixtures). The recycled asphalt shingle asphalt binder will mix with the virgin asphalt binder to create a final blended binder. The properties of the shingle asphalt binder may be considerably different from virgin asphalt binder. If the quantity of recycled asphalt shingle asphalt binder exceeds .75% by weight of the new HMA, the properties of the final blended binder may be measurably different from the design performance grade set forth by the local jurisdiction. The designer must be prepared to adjust the performance grade of the virgin binder to compensate for this difference. Roofing shingle scrap must be blended with a much softer (higher penetration/lower viscosity) asphalt cement binder for use in hot mix asphalt. Gradation: Roofing shingle aggregates (granules) consist of minus 4.75 mm (No.4 sieve size) particles, which supplement the fine aggregate fraction of hot mix asphalt . Shingle aggregate from recycled asphalt shingles will affect the gradation properties of the new HMA. The designer must determine the particle size and fraction of shingle aggregate present and adjust the virgin aggregate composition to meet the required gradation properties. Some of the mix properties that are of interest when roofing shingles are incorporated into asphalt pavements include the stiffening influence of roofing shingle fibers, strength, and stripping. Roofing shingle scrap (both organic felt and/or fiberglass felt) incorporated into asphalt paving mixes modifies the binder and also acts as a fine aggregate and mineral filler. Typically, an increase in filler content lowers the optimum asphalt cement content and increases the density and stability of the mix. Higher filler content can adversely affect durability due to reduction of voids in the mineral aggregate and optimum asphalt cement content. Also, excessive mineral filler can increase the surface area of the aggregate, reducing the asphalt film thickness. Conventional AASHTO pavement design methods are appropriate for asphalt pavements incorporating roof shingle scrap in the mix. Processed roofing shingle scrap can be blended with fine aggregates in a pugmill (at a ratio of three parts roofing shingle scrap to one part fine aggregate). (12) The fine aggregate acts as a carrier for the shingle scrap, preventing agglomeration and producing a material that can be stockpiled, handled, and fed through the existing recycle system of a batch or drum mix plant. The same methods and equipment used for conventional pavements are applicable to asphalt pavements containing roofing shingle scrap. Asbestos content in tear-off roofing shingles continue to be a concern for regulators. (16) A rigorous literature review and compilation of asbestos testing data was compiled in 2007 and found that asbestos was detected in just over 1% of the samples (out of 27,000). (28) Asphalt shingles contain asphalt a peteroleum derived product that contains polycyclic aromatic hydrocarbons (PAHs). Questions have been raised as to whether ground up shingles pose a direct or leaching exposure risk, as well as potentially impacting hot mix asphalt plant emissions. (28) There is no literature to indicate emissions at hot mix plants are any different using shingles. Further research on the leachability is currently being conducted in Florida. Ali, N., J. S. S. Chan, A. Potyondy, R. Bushman, and A. Bergan, "Mechanistics Evaluation of Asphalt Concrete Mixtures Containing Reclaimed Roofing Materials," Presented at the Transportation Research Board 74th Annual Meeting, Washington, D.C., January, 1995. American Association of State Highway and Transportation Officials. " Provisional Standard Recommended Practice for Design Considerations when using Reclaimed Asphalt Shingles in New Hot Mix Asphalt (R2005A-TS-2c) " Final publication in preparation. American Association of State Highway and Transportation Officials. Standard Method of Test, "Resistance of Compacted Bituminous Mixtures to Moisture Induced Damage," AASHTO Designation: T283-85, Part II Testing, 14th Edition, 1986. American Association of State Highway and Transportation Officials. " Use of Reclaimed Asphalt Shingle as an Additive in Hot Mix Asphalt: A Provisional Standard Specification (M2005A-TS-2c) " Final publication in preparation. American Society for Testing and Materials. "Asphalt Shingles (Organic Felt) Surfaced with Mineral Granules", ASTM D255, Annual Book of ASTM Standards, Volume 04.04, American Society for Testing and Materials, West Conshohocken , PA, 1996. American Society for Testing and Materials, Standard Specification D2726-96, "Bulk Specific Gravity and Density of Non-Absorptive Compacted Bituminous Mixtures," Annual Book of ASTM Standards, Volume 04.03, ASTM, West Conshohocken , Pennsylvania , 1996. American Society for Testing and Materials. Standard Specification D2950-96, "Density of Bituminous Concrete in Place by Nuclear Methods,"Annual Book of ASTM Standards , Volume 04.03, ASTM, West Conshohocken , Pennsylvania , 1996. American Society for Testing and Materials. "Asphalt Shingles Made From Glass Felt and Surfaced with Mineral Granules", ASTM D3462,Annual Book of ASTM Standards, Vol. 04.04, ASTM, West Conshohocken , PA , 1996. Baker, R.F. and E. Connolly. "Ground Bituminous Shingle Mix," Presented at the January 1995 Transportation Research Board Annual Meeting, Washington , D.C.
"From Rooftops to Roads," Asphalt Contractor , July 1995, pp. 42-47. Grzybowski, K.F. "Recycled Asphalt Roofing Materials - A Multi-Functional, Low Cost Hot Mix Asphalt Pavement Additive," Use of Waste Materials in Hot Mix Asphalt, ASTM Special Technical Publication 1193, American Society for Testing and Materials, West Conshohocken, Pennsylvania, 1993. Janisch , D. and Turgeon, C., " Minnesota's Experience Using Shingle Scrap in Bituminous Pavements " Report No. MN/PR-96/34 , Minnesota Department of Transportation, 1996. NTIS. Justus, H. G. " New Jersey Department of Transportation Experience with Recycled Materials," Recovery and Effective Reuse of Discarded Materials and By-Products for Construction of Highway Facilities, FHWA Symposium, Denver , Colorado , October, 1993. Klemens, T.L. "Processing Waste Roofing for Asphalt Cold-Patches," Highway and Heavy Construction, April, 1991. Marks , Vernon J., and Petermeier, Gerald, "Let Me Shingle Your Roadway." Research Project HR-2079 , Iowa Department of Transportation, Ames , Iowa , 1997. Ontario Ministry of Transportation. "Resistance to Stripping of Asphaltic Cement in Bituminous Mixture by Immersion Marshall - LS 283," Laboratory Testing Manual, Ontario Ministry of Transportation, 1995. Paulsen, G., M. Stroup-Gardiner, and J. Epps. Roofing Waste in Asphalt Paving Mixtures, Report 709-1, Center for Construction Materials Research, University of Nevada, Reno, Nevada, 1986. Turgeon, C.M. Waste Tire and Shingle Scrap Bituminous Paving Test Sections on the Munger Recreational Trail Gateway Segment, Report MN/RD-91/06; 9PR6002, Minnesota Department of Transportation, Office of Materials and Research, Maplewood, Minnesota, 1991.